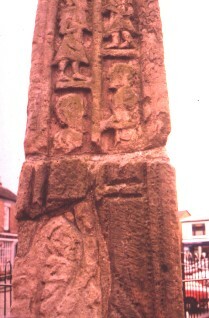 North Cross Shaft, North view. North Cross Shaft, North view. The cross is dated to the early ninth century. This is the base and the lower part of the Cross Shaft. There are figural panels along the shaft. This has been identified as the Apostles receiving the Holy Spirit, in tongues of flame, at Pentecost, New Testament, Acts 2:1.